Julien Duvivier (1896-1967) was one of the most talented French film directors of the 1930s and a superb technician. His work was praised by Jacques Doniol-Valcroze (“one of the best cinema artisans”), Michael Powell, Jean Renoir (“this great technician, this filmmaker of rigour who was also a poet”) and François Truffaut. The list of filmmakers who admired Duvivier is considerable and diverse in style, as are the critics, many of them associated with film modernism. Duvivier was held in esteem for his skill, his savoir faire and for the variety of material evident in a single film: a mix of fantasy, realism, expressionism, impressionism, the everyday with the spectacular and luxurious. In the composition of his romantic couples, for example, one partner is usually splendid, famous, wealthy, the other simple, sincere and modest (as in The Great Waltz ) – each enhanced by the difference. Almost all his couples are mismatched opposites often in conflict with each other, their relations in stress and fated for dissolution – as in some of his earliest films, for example, Poil de Carotte (1925) and Au bonheur des dames (1929), and his later historical costume spectaculars like The Great Waltz, Marie Antoinette (uncredited, 1938) and Anna Karenina (1948). This is especially true in his films with Jean Gabin. 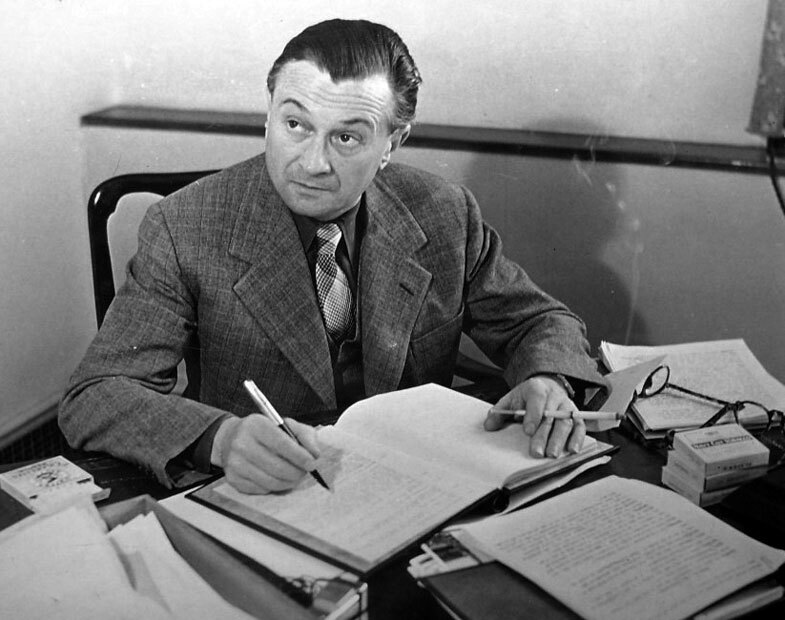 In 1937, Louis B. Mayer, on a talent hunt in Europe, offered Hollywood contracts to Duvivier and the scriptwriter who often worked with him, Henri Jeanson (1900-1970). Mayer also offered contracts in France to, among others, Gabin, Fernand Gravey, Danielle Darrieux and Henri Decoin. Jeanson eventually backed out and Gabin refused: “I am not prepared to sacrifice my independence for the glamour and gold of Hollywood”. Altogether, Mayer brought back with him seventeen contracts that included, besides those mentioned, the French actresses Mireille Balin  and Jacqueline Laurent, the British director Victor Saville, the Austrian actress Hedy Lamarr and the British actress Greer Garson. Duvivier signed a five-year contract with MGM, regarded by some in France as a betrayal of their cinema and hence a betrayal of the nation. The criticism resonated with an anti-Americanism particularly acute on the French Left in 1945 after the war, specifically involving national culture and, principally, the cinema. The American cinema, however popular with audiences in France, was critically denounced as vulgar, simplistic, a corruption of taste and art, and as a cultural invasion powerful because of its wealth. These positions were evident, for example, in the reviews of American movies in the Communist L’Écran français and by the film historian, Georges Sadoul, a Communist and a Surrealist, writing in the Communist cultural journal, Les Lettres Françaises. In contrast to these perspectives was the enthusiasm for the American cinema in the early 1950s by the young cinéphiles who wrote for Cahiers du cinéma (as well as its rival, Positif) and who later, as film directors in the Nouvelle Vague, unfavourably compared ‘quality’ French cinema to the Hollywood cinema which they literally adored. The Cahiers critics defended not only a new cinema, but a new criticism for which they had a distinct vocabulary and set of terms (auteur, mise en scène, cinéphile). Established critics and journals on the French Left, like Positif, were, at least for a time, vitriolic and dismissive toward Cahiers and toward filmmakers such as Alfred Hitchcock, who Cahiers especially prized. Cahiers critics were thought to be renegades and, worse still, reactionaries, politically right-wing, who had deserted French cinema and culture for imperialist, American trash. In 1937, Duvivier emphasised to those who questioned his choice to work in Hollywood that, for him, going there was a welcome opportunity. From 1948 until his death from a heart attack in 1968, Duvivier made at least one film every year. Of the five made in America, three were anthology films of loosely linked episodes: Lydia, Tales of Manhattan, Flesh and Fantasy. Lydia, in its structure and incidents, is like his Un carnet du bal (A Dance Card, 1937), made in France just before he went to America. The protagonists of Lydia and Carnet du bal revisit, in flashback, an episodic, romantic past of lost and re-imagined loves as if the heroines have, since their youth, been in exile from their past and thereby in exile from themselves. Their imaginary returns from the present are journeys of nostalgia, regret, disappointment and, above all, fantasy and invention, fictions made of dreams. What is most striking in these anthology films is the lack of motivation or causation between episodes – their primary link being associative, atmospheric and poetic. Most of Duvivier’s films, including the American ones, are films of exile, of a going away to an elsewhere. ‘Elsewhere’ is an entry into the fictional space that, once breached, is never deserted – hence their dreamlike, delusory aspect, where the films and their actors take leave from reality, more precisely take off, and often (as in Hitchcock) to approach the strange, the threatening and the disquieting. They also have concerns with memory and understanding similar to some Alain Resnais films, such as Muriel (1963), Providence (1977), Mon oncle d’Amérique (1980) and L’Amour à mort (1984). In many Duvivier works, exile results in a tragedy, as with those set in the North African desert, or tropical forests, starring Jean Gabin (with whom he made ten films in total): La Bandera (1935) centred on the pursuit of an escaped murderer in France who joins the Spanish Foreign Legion in Morocco; Pépé le Moko (1937) set in Algeria where a French gangster, takes, refuge in the labyrinth of the Algerian Casbah and where he runs a criminal gang, and The Imposter, which that takes place in the Congo (Brazzaville) in Central Africa. The three films are also love stories where Gabin pursues an impossible love that coincides with impossible longings and rejects a love that already exists and he is accustomed too. What cannot be had and yet seems to him to have everything is what excites him. The price of the impossible he pays is death. The Imposter is the story of an escapee from the guillotine during a German bombing raid of the prison where he is about to be executed and who, once freed by this turn of events, is given a lift on a French armoured personnel carrier. The carrier is soon destroyed by a German machine gun attack. Everyone is killed except for the character played by Gabin who had escaped the guillotine by chance, as here too he escapes death by chance. He assumes the identity of a French officer killed in the incident. In the three films, Gabin is a criminal – a role reminiscent of his character in Jacques Becker’s Touchez pas au grisbi (1954). In many Duvivier works, settings are exotic and enclosed, unreal, like a chamber film reminiscent of the work of Ingmar Bergman (who much admired him). His settings are at once realistic and fabulous, ordinary and glamorous, not unlike in a Josef von Sternberg film of juxtaposed opposites – often oppressive and at the edge of the surreal and terrifying. (Sternberg along with Victor Fleming, both uncredited, were involved in directing The Great Waltz.) They also recall the work of Orson Welles, who too admired Duvivier, as well recalling the realistic and poetic films of Jean Vigo and Jacques Becker. The escapees and exiles who populate Duvivier’s films, though having apparently escaped destiny, are pursued by it and end (as in the Gabin vehicles) haunted and destroyed by it. There is no turning back for these characters to what they once had been nor to where they had been; nor is there any possibility for them to move forward, to liberate themselves from the past – as if caught between, in a limbo betwixt past and present, memory and actuality, reality and the fantastic, reality and dream, here and elsewhere, this love and that. They are at once themselves but inhabiting another identity and, as a result, fictitious, masquerading, misremembering, not quite themselves, difficult to get hold of, all in different ways imposters (the essence of La Bandera, Pépé le Moko and The Imposter) in a dreamland where, although they may seem to be free and substantial, they are stalked by what they once were, between fictions from the past displaced by fictions in the present, by shadows, shades, a mirage made of desire. The structures are those of romantic melodrama, and also of Hitchcock. Exile, confinement, fatality, the impossibility of release, a lack of substance – all this is a perpetual state in Duvivier’s work linked in turn, compelled in fact, by passions and projections without substance or possibility. The old life and identity from which they escaped is irrecoverable, while the present is never free of this exilic state, thus escape and liberation are not only temporary, but elusive, intangible, illusory like a mirage. In their new life and identity, what would have happened to them in their former life (the guillotine, imprisonment, failure, death), now fatally reoccurs in the present, albeit as a variant of their unavoidable past, even if in a different guise, usually of suicide. Characters confront what they had spent years trying to avoid and forget and are haunted by those memories and identities. It is not unlike the fate of Oedipus, where every attempt to confound destiny ensures that what is destined will indeed come to pass, malgré tout. Their subsequent encounter with fate, even if a fate from which they flee, is ultimately, with nowhere to go, an acceptance, an embrace of the inevitable as a liberation from the ghosts of the past and, as such, an assertion. Associations with Oedipus and the fortunes of fatality lend themselves to the mythic, to the strange, to the dream qualities of Duvivier’s films. Duvivier recognised in Rossellini’s films a new kind of cinema, a new realism that would be called just that, ‘Italian Neo-Realism’, with Rossellini as its most distinguished, innovative and important figure. Duvivier called attention to two aspects of his films, at once political (a liberation from the Italian fascist past) and aesthetic (a liberation from existing film conventions), in both instances a break with the past. … these two films shatter the so-called laws of standardised, international cinema and tear down the walls of the impasse in which it has found itself trapped. I say without hesitation: these two films mark the end of the illusory link of cinema with theatre, and impose a necessary return to the essential canons of our art. Without being a masterpiece, Roma, città aperta is an important film, surprising, unexpected, shocking and exciting. It is surprising because we really didn’t expect much from artists who had been trained to bark – and who we wished had reacted more diligently around June 1940. It is shocking because, although it is a patriotic work, it does not glorify, despite the loyalty of its heroes to their cause, faced with the triumph of brute force, cowardice and hatred – thus leaving an aftertaste of blood. It is exciting because it gives the impression of witnessing a filmed reportage. It was not the story and its drama of Rossellini’s film that seemed important or new to Duvivier, but its authenticity where the conventions of fiction were displaced by the real. Duvivier emphasised the absence of stars imposing their personalities, the avoidance of overly elegant and accomplished lighting, the refusal of technical showing off and polish – but instead, a true story, which, although having been related a hundred times, is simply told and experienced before the camera by unknown actors who are striking in their humanity and even their awkwardness. The apparent inexperience of the director and the total lack of effects were, for Duvivier, virtues giving the impression of watching a document of scenes sometimes badly framed and shot, as if taken in haste at the last minute, as if the events depicted had just occurred and were recorded at the moment, in effect like Dziga Vertov’s “life caught unaware”. It was precisely these features in Rossellini’s film, recognised by Duvivier, that also impressed the writers of the Nouvelle Vague and that are evident in their own films, especially those of Jean-Luc Godard, Jacques Rivette and the early films of François Truffaut. What Duvivier recognised was a double aspect, a mirror effect: what the film portrayed (the events of the Nazi occupation and the Italian Resistance) and the portraying of it (the film in its directness and immediacy, a style that incorporated the presence and, by that fact, the consciousness of film inscribed in the film, the idea of film, the film as a document of itself). What is given birth to with Roma città aperta, for Duvivier, is the modern cinema – where film becomes not only its own subject and object, but an awareness of film whose drama is not simply an envelope for its form, but the reverse, where the drama places forms and structure of film on display, literally a reflection on the cinema, film about film. For Duvivier, the merits of Roma, città aperta were all the more obvious in Paisà, where usual aspects of narrative are violated – especially rules of continuity and uniformity. Paisà is not a single film but contains a multiplicity of films, like Duvivier’s anthologies composed of episodes, where what is stressed is less story as a unity or their logical connections, than comparisons, juxtapositions of incidents; and the episodic – associations rather than causation, fragments caught in their becoming, that rhyme rather than motivate. If the one film, Roma, città aperta, is simple in its means, the other, Paisà, for Duvivier, is simpler still – and if there are still traces of acting, drama, artificiality and theatre, the latter has so reduced these as to effectively negate the commercial cinema epitomised by Hollywood. Instead, it is a reportage and a document of its reporting, as if the film as film jostles for attention with what it has filmed – the representation and the representing like reflections, the result of which is a new understanding of not only what the cinema is, but what it has been, and (most importantly) what it could be. That is to say, with Rossellini, what is introduced to the cinema by its newness is the history of cinema. It seemed that Duvivier, one of the great artisans and technicians of the French cinema, admired by the most modernist of filmmakers, had encountered an entirely different cinema in Roma, città aperta: a modernism that his own films had been at the edge of becoming and that introduced to the history of film a history of style and form. Duvivier’s insistence on style, technique and the mechanisms of film that had attracted him to Hollywood were the features he celebrated, not unlike the appreciation by the Nouvelle Vague of the films of Howard Hawks, Alfred Hitchcock and American cinema more generally. It was in these terms of mise en scène, of its clarity and comportment, that Truffaut appreciated Voici le temps des assassins – i.e., an appreciation less for its drama than for the noticeability of its elements and the play, élan and citations of style. Apart from the aspects of form that Duvivier noticed and appreciated in the Rossellini films, there is a thematic accord with his own work, especially in Paisà: the episodes of the return of the past, not exactly as fate, but as shock and comprehension, that go well beyond Rossellini’s two war films of 1946 towards a third, Germania anno zero (Germany, Year Zero, 1948), and then toward his works with Ingrid Bergman, namely Stromboli (1950), Europa ‘51 (1952), Viaggio in Italia (Voyage to Italy, 1954) – films of the repetitiveness of time, its eternal returns and the awareness they bring that leads to a conversion of perspective and feeling, not as a consequence of logic, but more as miracle, crisis, surprise and scandal. This is evident also in Rossellini’s Giovanna d’Arco al rogo (Joan of Arc at the Stake, 1954) and, most movingly, in Generale Della Rovere (1959) where Vittorio, the conman, who had impersonated the dead General to extract information for the Germans about the Italian Resistance, chooses to die as the General he is not, but had become – the death of a hero. Another thematic accord between Rossellini and Duvivier brings both of them close to the cinema of Robert Bresson. In the final episode of Paisà on the banks of the Po (the American special forces die the same death as the partisans), and most strikingly in Germania anno zero and Generale della Rovere, suicide, the choice of death, becomes the only possibility – not exactly as an action thought out, but as an action that arrives, not as defeat, but as acceptance. Thus Rossellini’s Bergman films where the sense of a final act of acceptance seems to be without preparation, occurring unexpectedly, like a flash of light whose sense is only retrospective, without continuity – it can only be understood in the moment and ‘after’. The ‘first scenes’ of Germania anno zero and Generale Della Rovere are not what occur when the films begin, but when they end. The end changes everything that went before. What comes ‘after’ then, even individual shots alters all that preceded them – and so what comes ‘last’ is first. There is no continuity, linearity, causation, no build-up in the usual sense. Moreover, even in Rossellini’s films that have an apparent consequential narration, where it is evident what comes first and then follows, the scenes do not lead up to each other. Thus, the episodic structure so evident in Paisà also may be said to define the structure of Rossellini’s other films including Roma, città aperta, and especially the Ingrid Bergman collaborations of the 1950s, because, although acts may have consequences, it is the continuity and linearity of consequence that is lacking. Or if, there is consequence, the acts essentially become retrospective in their significance, as if the films had been leading toward their beginnings – not as flashback and certainly not as explanation. The final acts are shocking because they are not explained. They are simply facts, simply actions that occur. An explanation would be reductive and reassuring, but no reassurance is given. Such structuring recalls the films of Robert Bresson, especially his Journal d’un cure de campagne (Diary of a Country Priest, 1951), Procès de Jeanne d’Arc (The Trial of Joan of Arc 1962), Au Hasard Balthazar (1966) and, above all, Mouchette (1967). Bresson’s characters are either literally imprisoned or spiritually imprisoned, like the country priest, Mouchette or Balthazar, with nowhere else to go except to choose a destiny already, it seems, predetermined, and by accepting that predetermination freeing themselves from it. Unavoidably, in Bresson’s work, where predestination is a constant, his films begin where they conclude, as do Rossellini’s and Duvivier’s. Duvivier’s early films in the 1920s are explicitly religious: Credo ou la tragédie de Lourdes (1924), L’agonie de Jérusalem (1927), La vie miraculeuse de Thérèse Martin (1929), La divine croisière (1929). Pépé le Moko is a gangster film about a criminal. The fate of Pépé, his suicide, is like the suicide of Edmund in Germania anno zero, and like the acceptance of death in Generale della Rovere, and equally like the fate of Joan of Arc at the stake who refuses to repudiate her faith in order to save her soul – and thus the acceptance of her death is her triumph. These are sacrifices. Duvivier’s films are overcrowded with details and sometimes, as in the Casbah in Pépé le Moko, so enclosed, narrow and labyrinthine as to be claustrophobic. Details multiply in his films, seemingly like superimpositions, layered, criss-crossed, overlapped, knotted. Even scenes in the desert (La Bandera, Pépé le Moko) or in the African bush (The Informer) are full, jam-packed, spaces closing in on the characters. Exterior spaces are more like interiors, the desert as hallways, rooms, corridors, chambers, lines of cots – there is no exterior, no horizon, no escape, no exit, all the more effective because his films are in black and white, thus more fantastic, unreal, nightmarish, circumscribed, delimited and uniform than they might have been in colour. All Duvivier’s works are chamber films, Kameraspiel; even the emptiness of the Vienna Woods as it appears in The Great Waltz is overpopulated with trees, flowers, movement, song and music. His other films feature communal dances, funfairs, merry-go-rounds, the can-can, opera, concerts, parades, festivities, audiences, scenes of crowds turning round and round, spinning inwards and, as they turn, filling up space, thickening it, creating knots, circular – thus beginning where they end. The design of scenes is like the narratives, which are enclosures from which there is no way out, no relief, liberation, no alternatives – only limits, like the burdens and memories of the past from which his characters seek a respite in vain. The merry-go-round is a centripetal force. At their height, the intensity and force of such unremitting enclosures that are visual, architectural, psychological, of incessant sound, allow only one release from confinement and constraint, from being caught and condemned in a merry-go-round of perpetual tightening circles of fated repetitions: and that is, often, to surrender to death and welcome it. Mireille Balin played Gabin’s lover in Duvivier’s Pépé le Moko (1937). She was a beauty of the period and extremely popular. She went to America to take up the MGM contract but returned to France because of conflict with the American producer. During the war she had a German lover. When the war ended, she was persecuted as a consequence of her love affair as collaborator in a postwar purge (épuration). Part of the “Inquiry Into French Cinema”, Cahiers du cinéma, issue 161/162 (January 1965), pp. 90-1. François Truffaut, “Débat sur Duvivier”, Arts, issue 564 (18 April 1956), p. 5. “Les monologues de Monsieur Platon”, Cinémonde, issue 643 (26 November 1946).